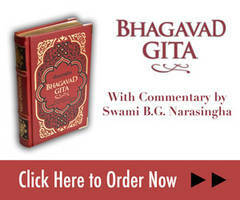 Those who follow the teachings of Srila Rupa Gosvami are known as rupanugas. Srila Rupa Gosvami was the chief disciple of Sri Caitanya Mahaprabhu and it was he whom Mahaprabhu chose to head the generations of future followers and worshippers of Sri Sri Radha and Krsna. Sri Caitanya Mahaprabhu read this verse and was overwhelmed by ecstatic love. When Srila Rupa Gosvami returned, Mahaprabhu slapped him mildly and said, “My heart is very confidential. How did you know My mind in this way?” After saying this the Lord firmly embraced Srila Rupa Gosvami. Thereupon, Mahaprabhu was very pleased and requested Svarupa-damodara to kindly give further instructions to Rupa in the matter of transcendental mellows (rasa). The significance of the praises of Srila Rupa Gosvami offered by Svarupa-damodara and Ramananda Raya may be considerably more meaningful to the readers when we take into account the ontological hierarchy in the spiritual world. According to Srila Kavi Karnapura, the author of Gaura-ganoddesa-dipika, it is said that in krsna-lila, Ramananda Raya was the gopi named Visakha and Svarupa-damodara was the gopi named Lalita-sakhi. Both Lalita and Visakha are the very intimate associates of Srimati Radharani, who alone can satisfy the desires of Lord Madhava. Lalita and Visakha are considered the personal expansions of the serving mood of Srimati Radharani, thus they are the two chief assistants in the madhurya-rasa – the love affairs between Radha and Krsna. Directly serving under Lalita-sakhi in the madhurya-rasa are the manjaris, i.e. the younger cowherd girls. This manjari group of servitors mainly consists of new recruits in the madhurya-rasa and due to their young age, they have been given the most sacred type of pure service to Radha and Krsna. The service performed by the manjari class we are to conceive most respectfully and attentively. When Radha and Krsna are in secrecy, in a private place, the older sakhis do not like to approach the Divine Couple at that time for fear of causing a slight disturbance. Radha and Krsna may feel some shyness in the presence of the older sakhis. But the younger gopis, the manjaris, can enter there without disturbing the free mixing of Radha and Krsna. This manjari group of servitors in the madhurya-rasa is headed by the gopi named Rupa-manjari. To perform their service, the manjaris headed by Rupa-manjari, sometimes go to that place where Radha and Krsna are intimately engaged in divine love dalliances. Such a high and intimate scope of service is available to no other group of servitors than that of the manjaris. 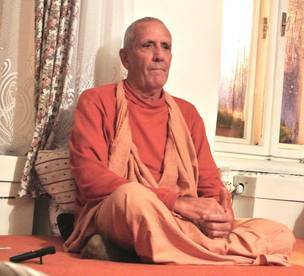 Rupa-manjari, who leads the manjari group, has appeared in gaura-lila as Srila Rupa Gosvami and Sri Caitanya Mahaprabhu has given him the supreme position as head of the Gaudiya sampradaya (rupanuga-sampradaya). So, the real meaning of rupanuga-bhajana is nothing less than that – the highest ideal of the highest spiritual conception. Following in the footsteps of Srila Rupa Gosvami ever desiring his mercy, falling prostrate at his lotus feet and praying again and again and again to be enlisted in his group of servitors. That is rupanuga-bhajana.